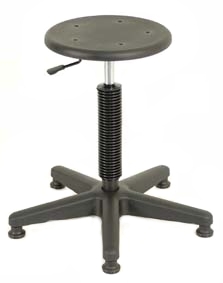 A height adjustable teachers stool supplied to Early Learning Centres. The stool is supplied on wheels so it can move easily across the floor. Shown in the picture is the stool on glides which limit movement. The option for glides adds $15.00. The stool has a 360mm diameter molded polyurethane seat for comfort.